Any good handlings on the gypsy thread out there? I have read a few and to my disatisfaction have found none that I like! The best I ever saw was a version I saw Gaeton Bloom perform on a Hank Lee Conclave video! Is this in print or sold? Any good versions at all in print? Any refrences to books would be great! What don't you like about Eugene Burger's handling? Please look at the book "The Fine Art of Magic George G. Kaplan" from his wonderful version. In my opinion the best preparation for the thread is Eugene Burger method. I tried hundreds of time with great success. Where is Eugene Burger's method published? I have "The Experience of Magic" and his new video set, but they only give his presentations, not his handling. I want to end Totally clean! Richard -- thanks...I'll have to check it out. Rick -- Eugene Burger has stated that he used to lap the extra pieces, but now just keeps them between his finger and thumb. After all, he says, who's going think 'Man, that was great, but he didn't open up his finger and thumb.'? I think more people will want to look at the thread, which will give you plenty of cover to ditch the little pieces. Check out Max Londono's version. It was published as part of the New Stars of Magic series. I second Randy's recommendation for the Max Londono handling in The New Stars of Magic. This looked stupendous when I saw him do it up at Tannen's years ago. That said, if memory serves, this is one of those "wax on the back of the thumbnail" methods. Someone correct me if I'm wrong. If you could end totally clean, would you pay ten bucks a performance for the necessary gimmick? I have seen a couple around but they are either to expensive to risk it or ust plain stupid. Get Steven's Magic Emporium's video by Eugene. He teaches all the ins and outs of the routine. I've been using that handling for over 10 years, and not once has anyone ever said "what's between your fingers?". They sit in stunned silence, every once in a while I'll hear, "No Way!". Basting thread is the hot tip... I found a few rolls in Italy last year... Fred Kaps' handling was using the Italian basting thread. I think it is the same as Marconick published in one of his many books. The trick is too easy, why complicate it? Yes, basting thread is ideal. And you're right about Marconik recommending it. Sometime in the 80's I remember buying a manuscript called "Markonik's Ultimate Gypsy Thread" (or something like that) from Paul Diamond, but threw it away during an overzealous house-cleaning. Does anyone know which book Markonik's write-up is in? Better yet, does anyone know where you can buy those spools of basting thread with the little cardboard tube in the middle? Can't seem to find them in the notion shops these days. I've looked all over town for them, but no one carries them anymore. It's the Steven's Magic Emporium "Greater Magic Video Library Vol 4" along with another 6 great routines. I highly recommend it. I too saw Londono perform his version of the Gypsy thread and I used to do it years ago. His version is a bit different in that the thread breaks apart into little pieces (almost as if by magic) not deliberately ripped off a spool as in most other versions and then visually restores. To the best of my recollection, there was no wax on the thumb involved. The Dragon Thread is a similar routine it think, but I liked the Londono version better. I remember a thread (no pun intended) a while ago about doing the gypsy thread using dental floss. This is helpful if breaking the thread hurts your fingers because, you can use the little metal thing meant for breaking the dental floss. It seemed that the main name they gave credit to was lonnie chevrie, check out the thread for more details its called "setting the record straight and crediting". I don't know if anyone is watching this post anymore but here is my 2 cents. I have most versions of the Gypsy Thread and "Max Londono's - Eternal String" is a great version if you want something you can carry with you at all times. This has an automatic reset so it can be immediately repeated or put away ready to be done again for repeat performances if your doing table to table work. This is from the "Stars of Magic" series and can still be purchased from the Magic Gadget Site for $15.95. If you just want the standard but very excellent Gypsy Thread then Dan Sperry of Theory11 has a nice download. It has all you need to know to perform the "Gypsy Thread" on the Theory11 website. Very reasonably priced. WGM from L&L has a nice DVD that has several performers showing their version of the "Gypsy Thread". And for you "Street Performers" there is a nice version on there from Cellini. And I do mean "Street Performers" and not you guys who go up to people on the street like David Blaine and think that is "Street Magic". Also if your looking for thematically relevant patter for the "Gypsy Thread" Gary Oulette has an excellent book and DVD. It comes with UV Glo thread as well. Very good. Well that is my 2 cents worth. Hope somebody reads this and it helps. Ciao! I saw Max Londono do his "Eternal String" and it was amazing. But the Stars of Magic description is lacking details (if I recall correctly). It's easy to see and easy to break. It's also easy to dye with flourescent dyes for using with black light (UV). Qua-Fiki and I included it as one of the ingredients in our Halloween Witches' Brew Book from The Wizards' Journal #23. Qua-Fiki suggested using baby booties as the ingredient, and have a pink, blue and white bootie for a spectator to choose from. Since you don't need the entire boot in the brew, you reach inside and pull out a thread of the appropriate color so it appears that you are unraveling the yarn from a baby bootie. Anyway, it's a nice touch to be able to allow the spectator to choose the color thread you will use. I did find a Eugene Burger explanation for his "Gypsy Thread". It is Volume 4 of the Greater Magic Video series. It has several of his signature effects and the only explanation I have come across other than his live lectures for the "Gypsy Thread". Also I used to do the "Eternal String" by Max Londono from the Stars of Magic and as far as I could tell the instructions were complete. I had no problems doing the routine. This is in response to Richard Kaufman's post of 11/12/12. I thought the instructions were excellent. I just read through the instructions again, they seem complete. But Richard is no slouch in the magic department. So perhaps he is noticing something I am missing. Anyway, I just thought I would let you know of the video with Eugene actually teaching his method for the "Gypsy Thread". If your looking for a book, "The Art Of Close Up Magic - Volume 1 and Volume 2 both have a version of the "Gypsy Thread" in them. Volume One is done with thread and Volume 2 has a routine done with yarn. These are both books published by L&L Publishing. OK, that is all for now. Eugene's version of "The Gypsy Thread" is also explained in one of his books that I published, either Performance of Close-Up Magic or Experience of Magic. I think. Richard Kaufman wrote: Eugene's version of "The Gypsy Thread" is also explained in one of his books that I published, either Performance of Close-Up Magic or Experience of Magic. I think. It's in The Experience of Magic. The preparation and handling are most fully described in Spirit Theater. The script is most fully described in The Experience of Magic. Does anyone know which book Markonik's write-up is in? I realise the question is 10 years old, but as it wasn't answered and the thread : ) has been revived ... you can also find the Marconick routine in Unconventional Magic by Ganson. As you would expect, a great description by Ganson and delightful Ali Bongo line drawings. I consider the effect one of the all time great effects, it ticks a lot of boxes. I never had a problem lapping the remains or dumping it somewhere in a standup situation. Played around with a small lump of Blue Tac attached inside the bottom rear of my jacket as a dump spot, but it never quite worked for me. Burger lectured in Toronto recently and he said to wind the thread around a chopstick, "forget the figure eight". Works for me. I agree with forgetting about the figure eight. That always tangled on me. 30 years ago I spent some time with Alan Alan and he taught me the figure eight, but I was never consistent with a tangle-free restoration. I just wrap it around a Bic pen and it's never failed. Rob Zabrecky does a flawless Gypsy Thread; emotionally resonant, too. I was watching my favourite scene from The Young Pope. I love that show. Best TV show I have seen since Mad Men. Anyway - the phrase "invisible red thread" struck me from the scene above. So - I did a quick google and found a lovely Chinese Proverb that I think would make a lovely presentation for this trick. I don't perform this trick. 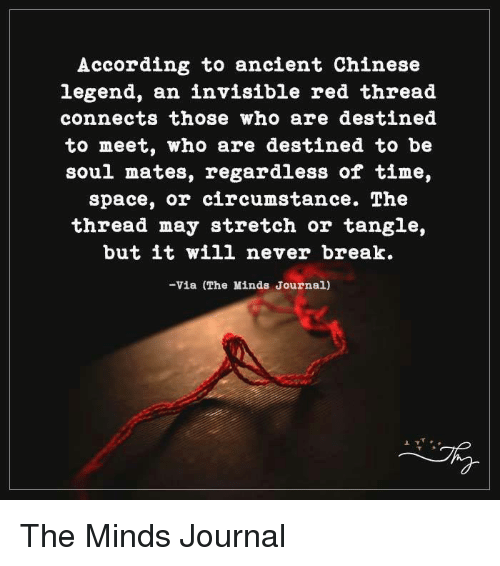 But I wonder if we could use the quote above and do the trick by tying a red thread onto the finger of two spectators who are in a relationship (eg a husband and a wife)? I use the red dental floss. Here is my version, I call it Heart Break. "The first time I felt true love was from my grand mother and when she died it broke my heart"
"My dog Champ, was my best friend, and when he died it also broke my heart"
And she would break my heart"
"All that heart break can really leave you twisted up inside"
"Those are the kind of feelings that can stick with you"
"But when the right one comes along"
"You will know she is the one, because there will be no more heart break"
...... Works great on women when they hold one piece of the floss as you restore it. In England the best thread that has always been recommended is Chadwick's Mending Cotton. (NOT Chadwick's Mending Yarn). Not made anymore but often found on eBay. If you have a good presentation, nobody is even thinking about little pieces. Lewis Ganson produced a Teach-In booklet which had a number of methods including Marconick's.